As this new range of dies from Tonic Studios were called The Millinery Shop Collection, I had to make a shop window card. I started off with a 7" x 7" card blank which I made by cutting down some sheets of A4 card, to make the window card this needs to have the fold at the top. To decorate the base card I cut one of the Beautiful Buckle dies out of matt gold card, cut it in half down the centre and stuck it to either side of my card blank, right on the very edge and trimmed off any overhang, top and bottom. I cut the I Wish You Well sentiment in both matt gold and patterned paper out of the vintage set which I drop shadowed and glued to the upper part of my card. 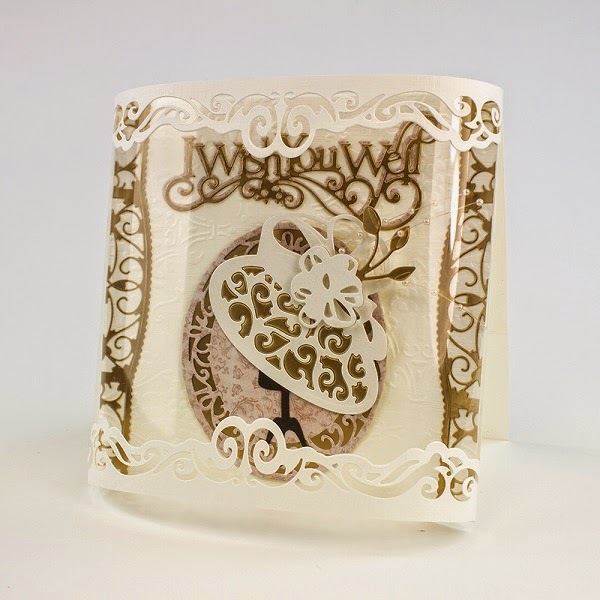 The Romantic Vine Oval was cut from matt gold and the same patterned paper to match. I made my hat stand out of the Mannequin Tag Die, just rounding the body off which was cut out of dark brown. The hat was cut from the Chepstow Bonnet die set. 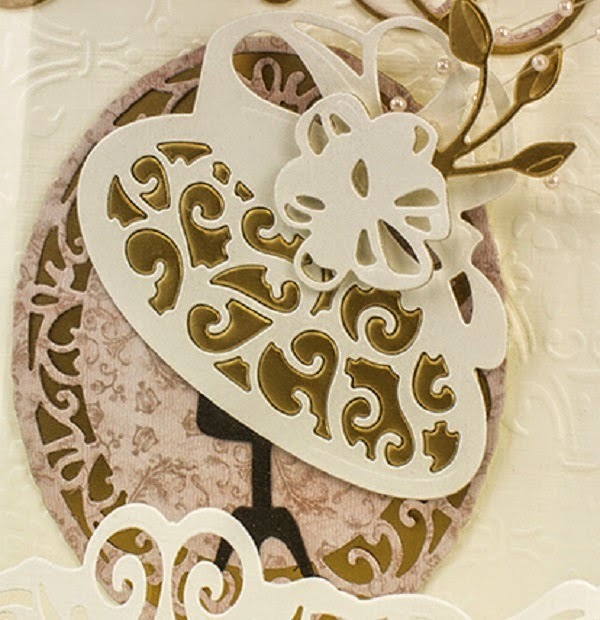 I cut the hat out of cream card and for the gold layer I embossed the die instead of cutting it which raised the 'cut outs' I then trimmed around the outside with a scissors and glued it under the cream layer, only using the brim of the hat. The gold layer seems to pop out through the cream. To decorate the hat I cut the bow and feathers in cream and gold, trimming the feathers off the cream one before layering them, I added some pearl sprays before sticking these to the hat with silicone glue for dimension. The window section was cut from a 7" x 10" piece of card. This was scored 1" in from either side for the overlap and the smaller more chunky border from the Lych Gate Wish die set was cut into the top and bottom. I then took a knife and metal ruler and cut the centre section away by cutting along the score lines. I stuck the same sized sheet of acetate inside and creased it well before sticking it to the rear of the card front. I tidied this up with another 7" x 7" sheet of cream card. I hope you like it. Tune into Jodie today on Create and Craft at 11am and 5pm to see more demonstrations.